Saltz is a professor, psychiatrist, columnist, bestselling author, television commentator, and magazine contributor, and she hosts "The Power of Different" podcast. The key message behind of book is fundamental to my work: brain differences grant us superpowers. That is, conditions like ADHD, so often thought to be "disabilities," show a disproportionate probablility for great talent and achievement. 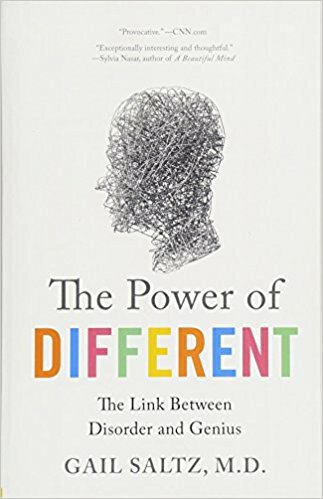 Research shows that people with "brain differences" who achieve great things don't do so in spite of their "disorder," instead their condition provides the talents, abilities, or superpowers to achieve great things. Saltz shows how the very conditions that cause people to experience difficulty at school, in social situations, at home, or at work, are inextricably bound to creative, disciplinary, artistic, empathetic, and cognitive abilities. Dr. Hallowell is a child and adult psychiatrist, a leading expert on ADD/ADHD, and the founder of The Hallowell Center for Cognitive and Emotional Health in Boston MetroWest, New York City, San Francisco and Seattle. He's a graduate of Harvard College and Tulane School of Medicine, and he has shared publicly that he has been diagnosed with both dyslexia and ADHD. In this essentional work, Hallowell and Ratey use vivid stories and case histories of patients — both adults and children — to explore the varied forms ADHD takes, from hyperactivity to daydreaming. They dispel common myths, offer helpful coping tools, and give a thorough accounting of all treatment options as well as tips for dealing with a diagnosed child, partner, or family member. But most importantly, they focus on the positives that can come with this “disorder”—including high energy, intuitiveness, creativity, and enthusiasm. 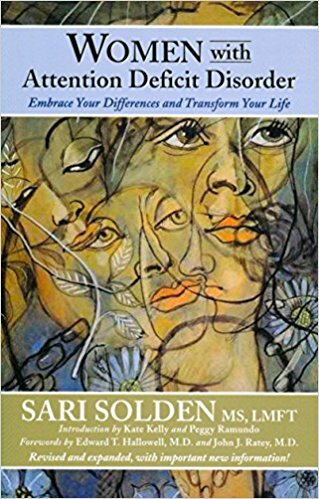 A psychotherapist in private practice with ADHD, Solden is best known as the pioneer in the field of women with ADHD, and her book "Women with Attention Deficit Disorder" was the first book written on the subject. She is respected worldwide as an author and speaker on ADHD, acceptance, and gender roles. Every year, millions of withdrawn little girls and chronically overwhelmed women go undiagnosed with Attention Deficit Disorder because they don't fit the stereotypical profile: they re not fast-talking, hyperactive, or inattentive, and they are not male. 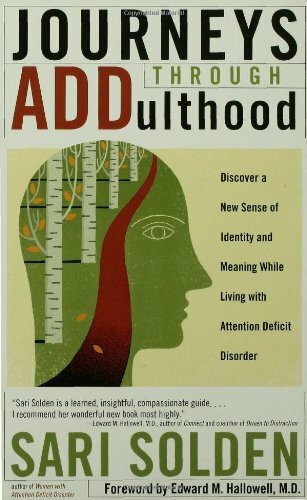 Sari Solden's groundbreaking study reveals that ADD affects just as many women as men, and that the resulting depression, disorganization, anxiety, and underachievement are also symptoms of ADD. She offers three empowering steps for women to restructure their lives life, renegotiate relationships, and redefine self-image in order to take control of their lives and enjoy success on their own terms. A clinical psychologist, professor of psychiatry, ADHD researcher, and prolific author of books on ADHD Barkley is recognized as a leading expert on ADHD and the neuropsychology of executive function and self-regulation. He also edits The ADHD Report, a newsletter for clinicians and parents. Provides a step-by-step strategies for managing symptoms and reducing their harmful impact. Readers get hands-on self-assessment tools and skills-building exercises, plus clear answers to frequently asked questions about medications and other treatments. Specific techniques are presented for overcoming challenges in critical areas where people with the disorder often struggle—work, finances, relationships, and more. Serves as an authoritative one-stop resource for adults with ADHD who are ready to take back their lives. Dawson and Guare have decades of experience working with clients on attention and executive skills. Both are with the the Center for Learning and Attention Disorders in Portsmouth, NH, where Guare is the director of the center and Dawson is a staff psychologist. The have authored together three Smart but Scattered books together, for children, teens, and adults. 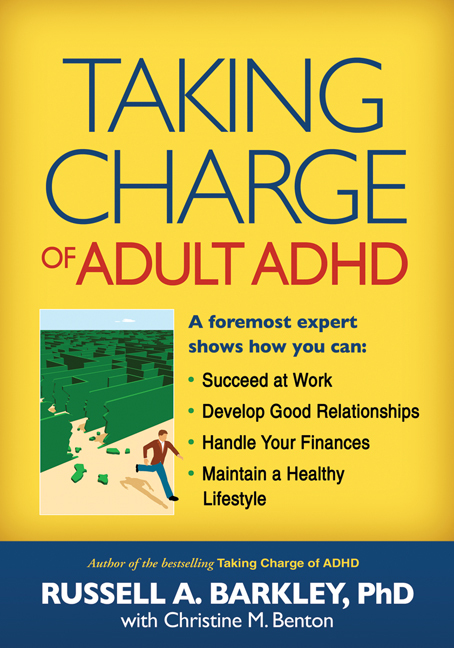 While this book isn't about ADHD, it does focus on something most people with with ADHD are challenged by: Executive Skills, like response inhibition, emotional control, task initiation, and goal-directed persistence. The book includes a brief assessment, and it offers simple and effective strategies for maintaining focus, dealing with clutter, and getting through busy days of family life. Dawson and Guare use science-based tools to improve each executive function – including modifying the physical or social environment, modifying the task, making a specific plan, setting a deadline, and externalizing the behavior you are working on. And what you can’t change, they show you how to work around. Highly recommended.